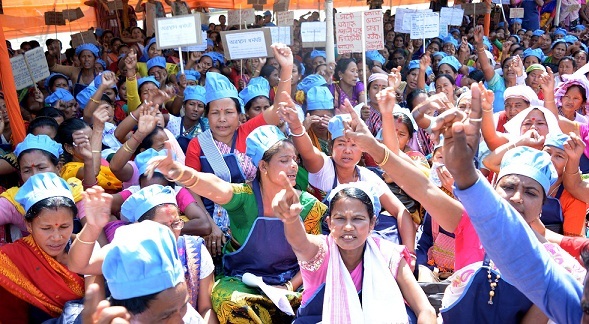 Members of All Assam Mid-day Meal Employees’ Union on Saturday took out a rally and assembled near Jorhat Head Post Office in protest against no hike in their wages as no mention was made during the State Budget presentation on Wednesday by Assam Finance minister Himanta Biswa Sarma. In the State Budget for 2019-19 presented by Assam Finance minister Sarma there is no mention of hike in wages of the cooks, who get paid about Rs 700 or so. The protestors shouted slogans against the government and stated that Union Finance minister Arun Jaitley had assured a delegation of mid-day meal employees’ union to increase their wages during a meeting in November last year, but so far it has not been executed by the government. Expressing anguish at the apathy of the government, a mid-day meal worker said that he was expecting something as the ASHA workers had got a good hike from Rs 1000 to Rs 3000. In another protest, Jorhat regional unit of the All Assam Students’ Union (AASU) on Saturday burnt a copy of the Citizenship (Amendment) Bill, 2016 in front of the Jorhat deputy commissioner’s office demanding withdrawal of the Bill.